Just in case you wanted to know exactly how reliant on Google you've become, the company is now offering monthly account activity reports on an opt-in basis. These reports cover signed-in activity on various Google services, including search, Gmail, and Google Latitude. They also indicate where users have signed in from, and which browsers or platforms they've been using to sign in. For example, users can look at how many searches they've performed (compared to last month), what they've been searching for most, and what types of searches they've been performing. The reports also count the number of emails sent and received, and where users spend their time based on Google Latitude. 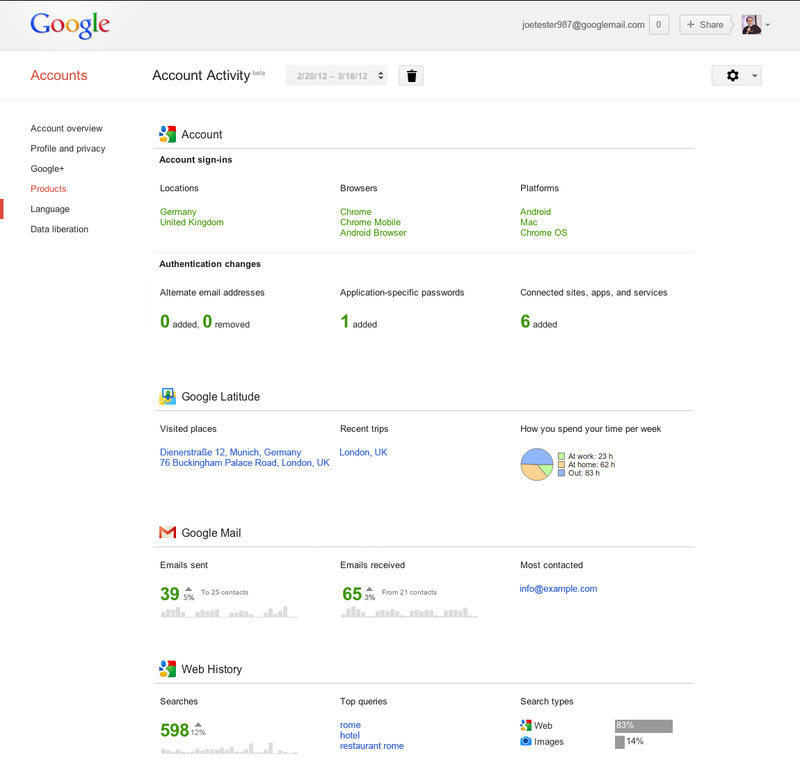 To start getting activity reports, you must visit Google's Account Activity page and opt-in to the service. Once you've signed up, the first report takes a few days to generate (so I haven't been able to see what Google has to say about my activity yet). It's not entirely clear why users would want to look at all of this activity, other than to satisfy curiosity, of course. In a blog post, Google product manager Andreas Teurk provides only one example: If you notice a sign-in from a place you haven't been, or on a device you don't own, you could then change your password or enable two-step verification. However, Google already warns users of suspicious activity automatically, so most users won't need to take extra precautions. Still, if you're concerned about data privacy and what Google knows about you, it's a good idea to visit Google's Accounts page every so often. Beyond monthly reports, you can get an overview of your lifetime Google use and even download an archive of your data from services such as Docs, contacts, and Picasa.